This year I got two new roles as part of my job: Division Technology Coach and Mentor. Both roles allow me to get to know new people, learn from my peers, and use my time to help staff members here at EG move down the path of new learning. As part of these new roles, I took a workshop this summer that involved Cognitive Coaching®. The idea behind coaching is that when someone comes to you with stress, problem, or something they are working on - our initial thought is to help them out and give them possible solutions. Studies have actually shown that when you give someone solutions, they only use them about 5% of the time. If, however, you use Cognitive Coaching® to help guide them towards their own solutions, they are more likely to feel better about the problem and know how to get there. I am definitely no expert yet, but it has been a lot of fun coaching my colleagues this year instead of always trying to pull something out of my bag of tricks. Oh - there are times people ask me how to do X, Y and Z on Schoology or Notability. For those times, I just sit down with them and play around in the programs. When they come to me with lessons that did not go perfectly or students they are struggling to differentiate for, however, I am trying to spend my time listening and asking questions to really see what they need and where they struggle before helping to guide them to their own answer that will improve everyone's learning. To learn more about Cognitive Coaching®, head over to the website where they have many resources. 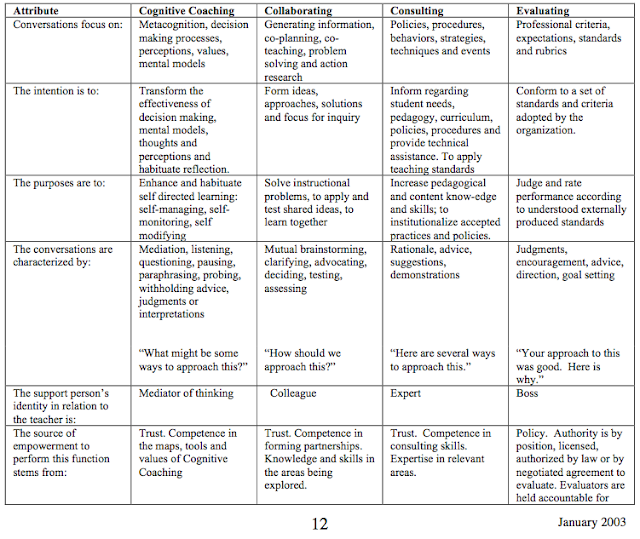 A great example of the work we did is this chart describing the differences between Cognitive Coaching®, Collaborating, Consulting and Evaluating found in the article "Cognitive Coaching® in Retrospect - Why It Persists." Peer Observation Day at Elk Grove High School! Technology and Literacy: What is the impact?